An unexpected but much welcomed session by Anish Trivedi , this veteran of the music industry came up and shared his experiences with the changing music industry scenario over the last fifteen years. With the onset of piracy , Torrent’s, itunes and so on, the industry attempted to protect themselves from the internet but eventually realised that there is no real way to do it. You cannot stop people from downloading free pirated tracks. The way out was to collaborate with online mediums to make it easier and more convienent for music to reach the people. He drew parallels in this respect with the publishing industry, which had all authors and publishers present nodding their heads in agreement. The paradigm has changed he concluded. 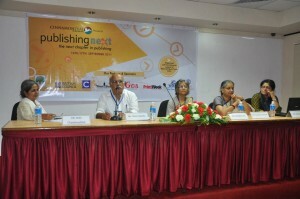 This session discussed the new roled of book marketing in the context of the prevalence of social media. Probably the much anticipated of all sessions, it was perhaps the most involved of all panel discussions on the first day of Publishing Next. Preeti Vyas, a big believer in social media platform, chaired the session and stressed on a one-on-one connection with the audience targeted by the book marketer. Echoing that sentiment, Maegan Chadwick Dobson of Tara books,Chennai stated that social networking is about “finding your personality and that of your company” and portraying that personality accurately constituted a good marketing strategy. More than just a marketing strategy, Social media should be used to develop a connect with your audience even before you start penning your book. Kiruba Shankar stated that it was more enjoyable to author a book when you collaborate with people online, an activity he said he himself followed and contributed to the marketing of the book. During the session, blogs, Twitter and Facebook were established as effective platforms for book marketing. Lipika Bhushan, Marketing Manager at HarperCollins India and Nikhil Pahwa, founder of medianama.com shared their views and experiences in this regard. Nikhil stated that since the time gap between a consumers impulse andpurchase has reduced, demands need to be met more efficiency. The chairperson of the session Ms. Indu Chandrashekhar, publisher and managing editor of Tulika books, New Delhi began this session, on The Future of Independent Publishing, by introducing the panel members, all of whom had rich experience on the independent publishing front. She first explained how IPDA, the Independent Publishers Distribution Alternatives, came into being. This organization constitutes independent publishers who came together to set up a distribution platform or mechanism that serves not only the needs of the founder publishers, but also new independent publishers across the country. Ms. Amrita Akhil, the Director of Marketing (IPDA), in her presentation, outlined the kinds of books independents publish and elaborated on how books were marketed. Next, Alvito Baretto who owns a selling service called ‘Focus Bookstore’ in Bangalore shared his experience and warned that while independent bookstores had it difficult to attract and retain customers, they should not lose sight of the values that they hold and abandon them in pursuit of profits. Ms. Radhika Menon (Tulika Publishers, Chennai) and Ms Mandira Sen (Stree-Samya, Kolkata) also provided their valuable inputs and brought their individual experiences to bear upon what was indeed a spirited discussion. They spoke about the marketing and editorial challenges they faced and provided unique insights into how independent publishers function in India, against all odds. A healthy audience-panel interaction then followed. Payal Kumar, Vice President, Editorial and Publishing at Sage Publications India, conducted a workshop on “The Art of Academic Writing” on the first day of Publishing Next 2011. Addressing various aspects of the topic, she stated the need for refined writing that will eventually help increase the chances of a piece of work being published. “The main reason why scholars manuscripts get rejected by journal is due to the fact that they do not keep in mind their readership audience when writing. Another factor would be the distinctive style sheet of a journal that isn’t followed,” Ms. Kumar stated. Ms. Kumar focused on the aim and scope of academic writing along with topics like plagiarism, citation and open source publishing.She has also laid emphasis on the need for turning authors into publishers.”Poor referencing reflects poor report writing”, she said in her presentation. The workshop ended with queries from the audience. 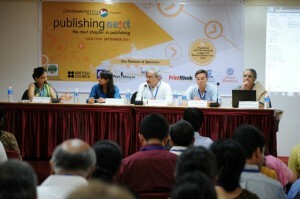 Publishing Next commences with panel discussion on, "Where are digital books headed?" 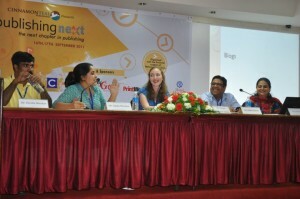 The first panel discussion was an attempt to answer the question: “where are digital books headed?”. Four panel members, James Bridle, Kailash Balani, Prathiba Sastry, Radhika Menon, along with the chair, Ms. Jaya Bhattacharji Rose deliberated on the scope of e-books in the rapidly evolving publishing environment. Ms. Radhika Menon presented her views on the the various type of digital consumers present today and showed with examples how her publishing house was coping with this mode of consumption. Digital books for children should aim at fulfilling the market demands of providing an overall educative experience, she said. James Bridle, publisher of Bookkake, exhorted the audience to remain true to the values they had imbibed as print publishers, values he said would hold them in good stead while developing ebooks. He said that there were many changes happening in the market whose impact it was still difficult to understand. 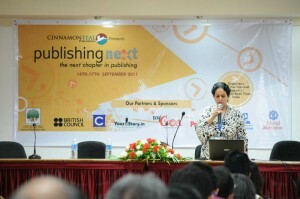 While Prathibha Sastry, of JiniBooks, asked the publishers in the audience not to shy away from ebooks and digital content creation, Kailash Balani of Balani Infotech provoked the crowd by stating the print was almost dead and that publishers could ignore digital books only at their own peril. An interactive Q&A session followed after which Ms. Bhattacharji Rose wound up the session by stating that while the industry was in a churn and many opportunities did present itself, there were an equal number of challenges that publishers have to be aware of and rise to.